﻿My children are natural artists and enjoy creating, just like all other children do. And while I frequently use art to teach other subjects, we have reached a point where they are ready to take things a step further. It's time, I think, to provide them with a real opportunity to explore the world of art and the famous artists who have so richly contributed to our world. So I have teamed up with an art teacher and one of the other homeschooling mothers in our community to put together a month-long workshop for all the homeschooled children in our town. 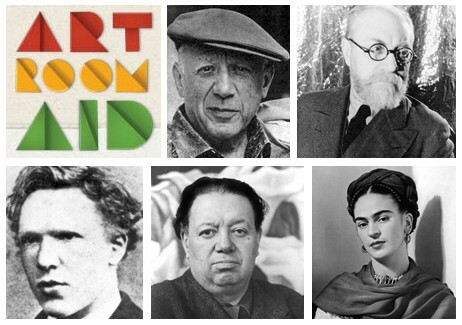 Exploring the Master Painters is the name of our project and it will introduce our students to five famous artists in history: Pablo Picasso, Frida Kahlo, Diego Rivera, Vincent van Gogh, and Henri Matisse. At the beginning of each class, the students will learn about the life of the featured painter, discuss the style most commonly associated with that painter, and then create their own art work. They will experiment with tools and techniques to create their own unique art piece based on the painter's style. But because we are a small community with limited access to art supplies and the funds with which to purchase them, we have decided to use Art Room Aid to help us make our project a reality. This program was created by Blick Art Materials as a resource to help educators easily fund their projects for free. There are no registration fees, and the entire process is simple and user-friendly. People may donate a cash credit that you can then use to purchase the art supplies from their online art store. Or people can just buy a specific item from your wish list and donate it directly to you! The tool works best if you do your part and promote your wish list via your own social media networks. But the great thing is that Art Room Aid has a Tool Kit with ways to customize flyers, letters, and emails that you can use to help you successfully promote your wish list. I just published our wish list yesterday and shared it on my personal Facebook page. Already several donors have chipped in...we are SO THRILLED! At a time when art programs are struggling due to budget cuts, I would imagine that Art Room Aid is a fabulous tool and much needed resource. In fact, the Department of Education released a report last year saying that the percentage of elementary schools without a visual arts class rose 13 to 17 percent over the last decade. I can't help but wonder how many of these are found in low-income neighborhoods? If you are an educator looking for ways to fund an art project for your students, you can create your own free account here. Stay tuned tomorrow and find out what 500 artists had to say about inspiration! Disclosure: This is a sponsored post in collaboration with the Motherhood. All opinions are strictly my own. I only work with campaigns with which I approve or agree and feel are beneficial to my readers.